My trip was to attend a one-to-one training course which was supplied by Nanopore Solutions Ltd at ITQB-NOVA in Oeiras, Portgual. The aim of the training was to introduce myself to a modern method of nanopore fabrication, but also covered many other elements of nanopore experimentation such as equipment set-up, troubleshooting and data analysis. I hope to apply what I have learned to my work in the future. The highlight of the trip for me was the opportunity to network with James Yates, the Manager of Nanopore Solutions, which gave me further insight into the nanopore and biosensing industry. However, it wasn’t all work and no play, I managed to see Lisbon, sample the local delicacies and even tried a spot of surfing which is not as easy as it looks on TV. As part of the CDT programme we take part in a unique set of training focusing on leadership, management and teamwork skills under the ‘transition zone’. Last month I got the opportunity to apply these skills in the Engineering Young Entrepreneur Scheme at Nottingham University. The challenge ran from October 18th to 20th and consisted of two full days of training and mentoring before we pitched a business to a panel of judges on the final day in the form of a presentation. 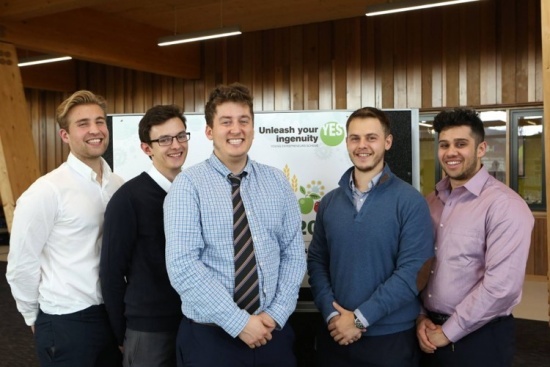 Our team consisted of cohort 2 and 3 students including myself (CEO), Marcus Pollard (Finance Director), Joel Earps (Research and Development Director), Robin Hamer (Commercial and Marketing Director) and Athansios Pouchias (Operations Director). Our business was called ‘Intelligent Cold Engineering – ICE’ and aimed to reduce food waste within the cold store part of the supply chain through technology based on the internet of things and sensor-based intelligent management system. Even though we were pitching a fictional company for a fictional investment, we still applied the knowledge we had gained through the seminars and training sessions in finance, marketing strategies and intellectual property to develop a real and convincing business model. For this reason the competition was an invaluable experience to undertake during the PhD. In addition to our studies, we got the opportunity to see and understand the necessary steps in building a start-up company and what must be considered. One of the most insightful aspects of the competition was the ability to see and reflect upon other groups and other entrepreneurs work, and see what methods were successful in obtaining funding. As early career researchers gaining an understanding of this is truly valuable. Also, we had hours of personal mentoring with financial experts, business leaders and venture capitalists who were able to reflect upon their own experiences within obtaining and giving funding. The event was very well run, as each day managed to fit in so many activities in addition to us developing our business pitch. Personally, I am truly grateful that I got to experience this opportunity with close colleagues as it was through hard work, and a positive atmosphere that got us through the often long nights required to finish the work. I would also like to thank Tracey Hassall-Jones for organising the event. I believe this was a fantastic opportunity to practice presentation and finance skills. However, what I was most grateful for was the opportunity to see how non-technical audiences interpret the work of the CDT. Embedded intelligence is a very technical field and often as PhD students we spend the majority of our time communicating with our technical audiences, often we can forget just how important it is to develop our communication skills to all audiences and understand what their agenda and take away might be. I would thoroughly recommend this experience to students in the other cohorts, but make sure you approach it with a positive attitude where your aim is to learn as much as possible from the experience, even in failure. This is a particularly important skill as an entrepreneur because if you aren’t failing, you aren’t trying hard enough. Cohort 4 researcher, Maren Schnieder, attended the 5th World Collaborative Mobility Congress – "wocomoco" – in Berlin, Germany. The congress, which is hosted each year by the Swiss Mobility Academy, is a meeting place to discuss the latest innovations in car-, ride- and bike-sharing as well as in ride-hailing and in mobility as service (MaaS). Over the three days, key note speakers from Europe and America presented their innovative mobility solutions. Maren especially benefited from the presentations about bike sharing, logistics, cargo bicycles, ebikes and the digital shift in road transportation. The congress was an ideal platform for Maren to discuss with ebike-sharing startups, city planners, public transport providers and researchers what the next generation electric (cargo) bicycle has to offer. Cohort 1 student Joe Holt recently attended the COMSOL Conference 2017 in Rotterdam, the Netherlands during the 17th, 18th and 19th of October. I had the opportunity to present my conference paper “3D Acoustic-Structure Interaction of Ultrasound in Fluids for the Manufacture of Graded Materials”, which can be viewed here https://www.comsol.com/2017-user-presentations/multiphysics. My slot was in the Acoustics branch of the user presentations where I presented my work on the acoustics of foams. In my model the foam is represented by a bulk material model that calculates the resulting acoustic field in the foam, excited by ultrasonic transducers. The presentation and paper were well received and a number of the questions at the end of the talk were related to application of the model. This model forms an important part of my research which is trying to assess the feasibility of using ultrasound for the manufacture of porosity graded polymers and composites. During the conference I had the opportunity to network with numerous other COMSOL users from around Europe and discuss our methods and challenges. Additionally, there were COMSOL workshops on specific packages within the software. I managed to attend five throughout the duration of the conference, which provided me with some fresh ideas for my future modelling work. Human factors: What flavour are you? Furthermore, after listening to the talks at this conference it is clear to see that human factors is applicable in 4 distinct areas: existing operations (most money being spent), new builds (some money being spent), decommissioning (no/little money being spent) and fuel recycling and waste storage (little money being spent). This was a great help to know where the scope of the PhD may be best suited for the greatest impact. Highlights of the day included networking with: Grant Hudson and Christian Wilhelm. I found that both Grant and Christian were very interested by the topic of the PhD and Christian who is also trying to do some Safety-II work and was very interested to share knowledge. They would also be very keen to participate in the expert panel interview which was very useful as they are both in different sectors within the nuclear industry. I also obtained some information on people who are attempted to do practical work on Safety-II in other industries (there was a mention of someone doing work with aviation). I hope to follow up on these leads and find out more information of where Safety-II may fit in. To summarise, the event was very useful to hear about the burning issues within decommissioning especially with a human factors focus. The event provided some useful networking opportunities which gave some useful contacts. Finally, the event has prompted me to attend more human factors conferences to develop and grow my personal network. I attended the inaugural West Midlands Seminar for the Oil & Colour Chemists Association (OCCA) at the Ricoh Arena, Coventry on Monday 16th October. It aimed to bring industrial partners and academia together to discuss the latest advancements in the coatings sector. Established in 1918, the OCCA has been a leading association in accrediting work and encouraging partnerships within the coatings sector. The seminar had four guest speakers from a variety of backgrounds and companies. The first speaker was from Tremco and was titled ‘Fire Prevention’. The presentation began with many statistics on fire, with the most interesting being that it would take less than 4 minutes to fill a 6 metre cubed room with smoke through a hole the size of a pencil. This has lead companies to strive to compartmentalise buildings to prevent the spread of fire and smoke, leading to intense research into finding materials to plug holes in walls around windows, doors, electrical cables and pipes. Tremco manufacture passive fire prevention techniques and give their products ‘fire prevention ratings’ E30, E60, E120, E180 and E240, which are the minutes they can withstand a temperature increase of +140 degrees compared to ambient temperature. An interesting point from this talk was that certain fire prevention materials are well suited to only a small number of uses. For example, polyurethane foam is able to have an E240 rating for horizontal and vertical joints between bricks and concrete, but if used to fill a larger hole, e.g. 200mmx200mx150mm, it only withstands heat for 5 minutes before combusting and failing. I found this talk extremely interesting and informative. There was a good balance of case studies and how they affect the processes and testing undertaken by the chemical industry. SurfaChem gave a talk on titanium dioxide and its changing uses over recent years. TiO2 is used in sun cream to prevent the harmful effects of UV. In the USA, skin cancer is classified as a disease, and as sun cream prevents this disease, it is certified as a drug by the FDA. In the EU, sun cream is classified as a cosmetic product and is subject to different laws. The nano form of TiO2 is often used in sun creams. The concerns about the use of nanotechnology were raised, including can the nanoparticles be inhaled, and as TiO2 is not naturally occurring in humans, can it be excreted. Issues around labelling were also raised, and the example of paraben was cited; people stopped using paraben based on a medical report, yet it was still used in Calpol, and were still giving it to children. The point about risks and benefits outweighing each other were discussed, and what the chemical industry can do to label chemicals in a way that does not cause panic among consumers. This talk was very informative and opened my eyes to the considerations the chemical industry has to take when developing products and how they are labelled and marketed. A short coffee break followed to allow for networking opportunities, and discussions with companies with table top displays. The third speaker was from Altana and was titled ‘Using Laponite for Unique Rheology Modification Properties’. Laponite is a synthetic inorganic layered structure based on an octahedral arrangement of lithium and magnesium and a tetrahedral arrangement of sodium and silicon. It can be dispersed in water to form a gel. It has a unique rheology that allows sheer thinning viscosity. The delegate explained the applications of laponite, which mainly consisted of allowing pigments in paint to be suspended evenly and allow a better distribution of colour and there was a demonstration of multi-coloured paints and how laponite is key in ensuring different colours in paints aimed at replicating materials such as granite do not mix. Other applications of laponite involve wood coatings and coatings in the automotive industry. The talk was well structured, and offered a good insight into an industrial company and the work they do in the coatings sector. The final speaker was from the company Samuel Banner and was about Biocides and related challenged. It was explained that biocides are chemicals added to coatings that are there to fight off fungal growth on or within the coating. There was a lot of information on the legislation to do with certification and how the industry needs to label their chemicals. One interesting point was that if a company makes a claim, for example, ‘kills 99% of bacteria’, it costs over £2 million to make that claim, and they have to back it up within 2 years of submitting it. This was the most challenging talk of the day to understand as there were a lot of acronyms without definition hence I felt it was aimed at the industry experts and did not engage enough with people from outside the direct circle of biocides. All in all, it was a positive first experience at a conference. There were many important things the industrial world has to consider within chemistry which were highlighted and I can now reflect upon these when I am doing academic lead chemistry. It was also good to gain my first experience in networking opportunities. The conference "8th European Conference on Precision Livestock Farming" was held in Nantes France. Cohort 1 research Adrian Ayastuy Rodriguez presented a poster and published a paper titled "Novel activity monitoring system based on smart collar and variational Bayesian learning of multivariate autoregressive hidden Markov models". Adrian found the research presented at the conference to be of interest and took the opportunity to discuss work on tracking animals and predictive healthcare with peers. In particular, new techniques for measuring animal weight without direct contact and new techniques for location tracking and behaviour recognition. During the poster session there was significant interest in Adrian’s work and the method used to analyse data. There is potential for new collaborations from these conversations. On the final day of the conference there was an excursion to SPACE '18 an exhibition of livestock in Rennes. The exhibition allowed Adrian to meet distributors of animal collars, which he has been using throughout his research, and to discuss the technical aspects of sensors, the ergonomics of collars, and as well as the market and industry. On the 19th/20th September the Digital Catapult Centre hosted the Entrepreneurship workshop, organised by the Digital Economy Network. Two PhD. students from the CDT-Embedded Intelligence, Orange Gao & Youssef Hamid took part on this experience which was a successful combination of workshops led by Prof. Philip Treleaven, UCL from UCL and practical hand’s one business creation simulations. The round table workshops focused on entrepreneurship methodologies (Identifying your idea, branding and vision) and skills to acquire (Business model canvas, funding pitches). The PhD entrepreneurial journey was put in perspective by 4 real experience presentations where Ex-PhD students told the stories of their transition from a PhD student to a CEO or Confounders of their businesses. Participants were encouraged to take a part pf the Dragon's Den competition where teams of 4 to 5 PhD students pitched their new business ideas to the event’s organizational board. The £1000 prize winner idea “Cycle Rack” presented a mobile app offering London cycling commuters a safe and affordable parking spaces. The winning team (pictured below left) included Youssef Hamid - CDT-EI, Alex Owen - Web Science CDT, Yitong Huang - Horizon CDT and Cristina Guerrero - IGGI CDT. The team on the right are Orange Gao - CDT-EI, James Burnett - Horizon CDT, Keisha Taylor - Web Science CDT, Faiza Bukenya (Sustainable Energy Tech PhD Student) - Uni of Nottm, Tugba Gurler (Computer Science PhD Student), Uni of Nottm. Thank you to Felicia Black for organizing such a successful event and to Prof. Teleaven for bringing the entrepreneurs. You can read more about the Entrepreneurial Workshop on the DEN blog. ©2014 Loughborough University, Heriot-Watt University. All rights reserved.